Sunday, November 21: Ojibway's field trip to Point Pelee experienced very mild conditions for late November with such sightings as 22 Green Frogs in one small pond, Northern Leopard Frog, +50 calling Spring Peepers, two Eastern Pipistrelle Bats and Common Green Darner Dragonfly. Eastern Garter Snake and Midland Painted Turtle were seen today at Ojibway. Sunday, November 14: Orange Sulphur and Clouded Sulphur butterflies were reported today from Malden Park. Tuesday, November 9: The hard frost last night killed the annuals in the nature centre's flower beds and other late blooming species such as pokeweed. 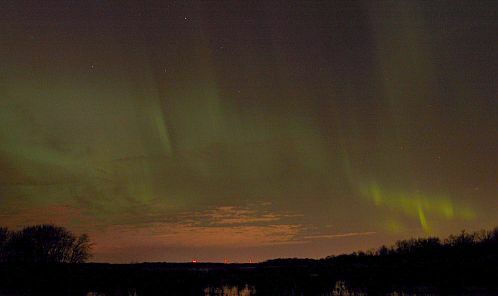 A spectacular display of Northern Lights was seen Sunday evening throughout the region. Paul Pratt took the above photo at Holiday Beach C.A. Bruce Kershner, author of the Sierra Club Guide to Ancient Forests of the Northeast was the guest speaker at the Essex County Field Naturalists' Annual Dinner on November 6. After visiting Ojibway Park and Black Oak Heritage Park he stated that Windsor is only one of four cities in northeastern North America to support ancient growth woodland within city limits. Tuesday, November 2: This is prime time for birders to visit Holiday Beach Conservation Area and look for Rough-legged Hawks, Northern Goshawks and Golden Eagles. Four Rough-legged Hawks and five Golden Eagles were seen there yesterday along with 79 Red-shouldered Hawks. The best weather conditions for hawk watching include a mix of sun and cloud with winds out of the north. Wednesday, November 3: The nature centre had a great field trip to Point Pelee today with an excellent total of 79 species recorded. Highlights at the tip included thousands of Lesser Scaup and Red-breasted Mergansers, several Common and 2 Red-throated Loons, White-winged and Surf Scoters, adult Northern Goshawk, many Red-shouldered Hawks, Rough-legged Hawk, Eastern Phoebe, Pine Warbler and Blue-gray Gnatcatcher. We also birded around the Visitor Centre (American Woodcock, Winter Wrens, Hermit Thrushes, immature Northern Goshawk), Sanctuary Pond (adult Bald Eagle diving for fish), Days Inn (10 Great Blue Herons, 50 Dunlin, 2 Wood Ducks, Gadwall) and the Seacliff hawk watch site (vultures, many Red-tailed Hawks, 2 Rough-legged Hawks). A few people stopped by The Chrysler Canada Greenway at Kratz Road (just east of Kingsville) and were rewarded with 7 Eastern Bluebirds and a Northern Mockingbird. Copyright � 2004. All rights reserved. You are on a City of Windsor Web Site.